Our tale begins two and a half millennia ago, when a nomadic people called Scythians roamed Eurasian steppes from Mongolia to Eastern Europe. They were a warlike people, and 20% of the bodies found in excavated warrior graves were women. This may have given rise to Greek myths about Amazons, women warriors who were fiercer than men. A large group of them settled in lands north of the Black Sea, the southern Ukraine. In fact, their capital city in Ukraine was by far the largest city of its time period ever excavated. 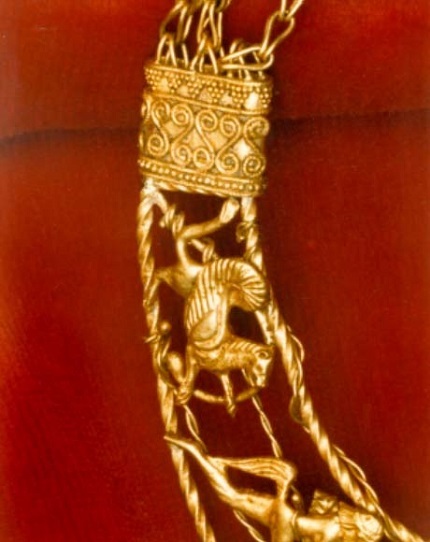 Among the many Scythian passions was a love for finely crafted gold objects. Ancient Greeks, being a seafaring people, sent trading vessels along the coasts of the Black Sea. Recognizing the huge, lucrative Scythian market for gold objects, expat Greek goldsmiths settled in Odessa and Olbia and began turning out the most exquisite objects from antiquity. Thousands of these objects went into burial tombs, thus escaping being melted down by subsequent conquerors. Some of these burial mounds were 60 feet high. Since most of these graves were in the USSR, the greatest agglomerations of Scythian gold artifacts are found in Russian and Ukrainian museums. Many objects, however, did evade the grasps of Czars and Commissars. 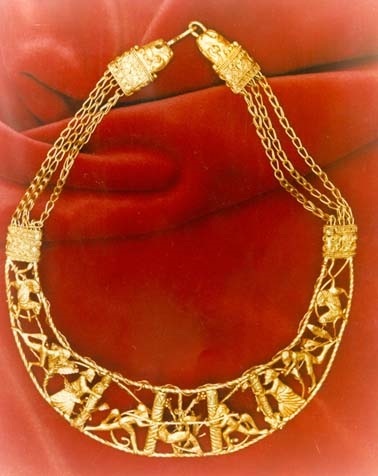 In 1937, in the Middle East, an Italian diplomat (he may have been attached to the military; Libya was an Italian colony) purchased from a rich family a fabulous Scythian necklace as a gift for his wife, Bianca. The substance of his analysis, including the color picture shown below, was published in Burlington magazine, England, perhaps the most influential analytical art periodical published anywhere in English. Detail of the top of the necklace, near the clasp. 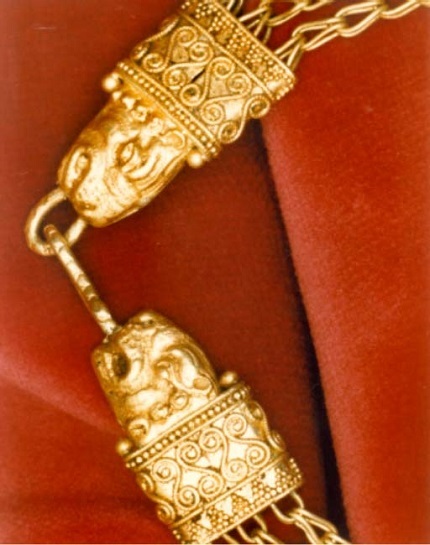 Detail of the clasp of the necklace. Through a mutual client, I became acquainted with a stunning and energetic young Italian expat whom I will identify simply as Antonina. I recall she could claim an Italian title. Her husband was of Balkan origin, they had a couple of young children, and they lived in Foggy Bottom, a tony part of Washington, D.C., not very far from Watergate. Antonina was a private art dealer and consultant. She was allied with a pair of art dealers in Italy. When I met them in Washington they insisted on calling me professore. I suppose because I had written some books and looked vaguely like Albert Einstein. They brought with them the Scythian necklace. Needing some American expertise, Antonina and I took the necklace to Dr. Edward Haddad, an appraiser for whom, in a reversal of roles, I had done a great deal of work. Ed was one of those infuriating people who seemingly could remember every artifact he had ever seen or read about. While serving in the American Army in China before WWII and with nothing to do, Ed had studied every day in Chinese museums. After the war he was part of the group who handled the dispersal of the art property of War Crimes Prime Minister Hideki Tojo. Haddad examined the necklace meticulously, read all the published and private data he was given or could find, and came up with an appraised value of $2.5 million. I have certified copies of the appraisal. That was too risky for either Antonina or me to house. A mile from the D.C. line there are two secure public vaults, one in Chevy Chase off River Road and the other in Spring Valley, on Mass. Avenue. I have used both and don’t recall which vault we used to lock up the beguiling necklace. We kept other art there, including an oil painting by Gian Lorenzo Bernini. Our space was accessible only by either Antonina or me. Then we faced the task of finding a buyer. The quality of the necklace cried that it should be in the Smithsonian, the Getty, or Baltimore’s Walter’s museum. But we didn’t have the necessary papers proving exactly where it was found and when it had left its country of origin. Without these, sale to a public institution was problematical. I had some protracted conversations with curators at the Smithsonian. The museum would have liked to have the necklace but, being a government institution, couldn’t risk the acquisition. One of my occasional collaborators was Mitzi Daines. Her husband Kay, Bob Bennett, and I had created Collectors’ Investment Fund. That’s how I met her. Mitzi was energetic, imaginative, and persistent. Indefatigable, she could get in to meet anyone. She decided the perfect buyer for the Scythian necklace was Elizabeth Taylor. I thought Mitzi would never break through the wall of gatekeepers that protect superstars like Taylor. I was wrong. Working through the last personal assistant, Mitzi met Elizabeth Taylor herself, showed the pictures of the necklace, and presented the appropriate documents. Taylor was entranced. She fell in love with the necklace. It was, after all, a unique and very old piece of jewelry. No other woman would ever be able to match it. She said she’d have Richard Burton buy it as a gift to her. They had been married and divorced twice but remained passionate friends. “I’ll have Richard buy it.” There was no doubt in her mind. But Elizabeth Taylor was no dummy. She had purchased a lot of jewelry and received scads as gifts. She wanted proof of the necklace’s antiquity. She was not going to be fooled by a modern fake. Would we agree to let her expert examine the necklace? Her expert turned out to be an older jeweler from Alexandria, Virginia. Antonina and I let him into an examination room inside the vault, retrieved the necklace from our inner vault, and put it on a table where he could examine it for as long as he needed. Among other things, the jeweler brought with him a small array of chemical testing tools. Very carefully, he used these to assay the gold. He compared his test results with his data and charts. When he finished his determination he turned to us and said the necklace was genuine Scythian gold, not something more modern or from somewhere else. The necklace was genuine. His decision was sent back to Elizabeth Taylor. The necklace went back into safekeeping in our vault. We hoped this locked-away period would be very short. Before Elizabeth Taylor could beguile Richard Burton into buying the Scythian necklace for her, Burton suddenly died. The spectacular actor was only 58. Taylor had the money to purchase the necklace herself, but even though Burton had never owned it, in her mind it would always have an unfortunate association with him. The sale was never made. My 13-chapter fiction would trace ownership of the necklace (in big leaps, of course) from the day it was first fashioned 2500 years ago by a Greek expat in Odessa through subsequent owners, including Esther, the New Testament Magi, a Roman queen, Queen Christina of Sweden, Katherine the Great, and an Arab who used it to finance the fight against French colonists in Algeria. The Necklace had the substance of a good yarn. Since blocking it out in considerable detail, for 22 years I have carried the outline around in my Day Planner, thinking I would write the novel. But I never did — in fact I almost never look at those pages any more. Maybe once a year. Like the sale of the genuine piece of jewelry to Elizabeth Taylor, its fulfillment vanished.